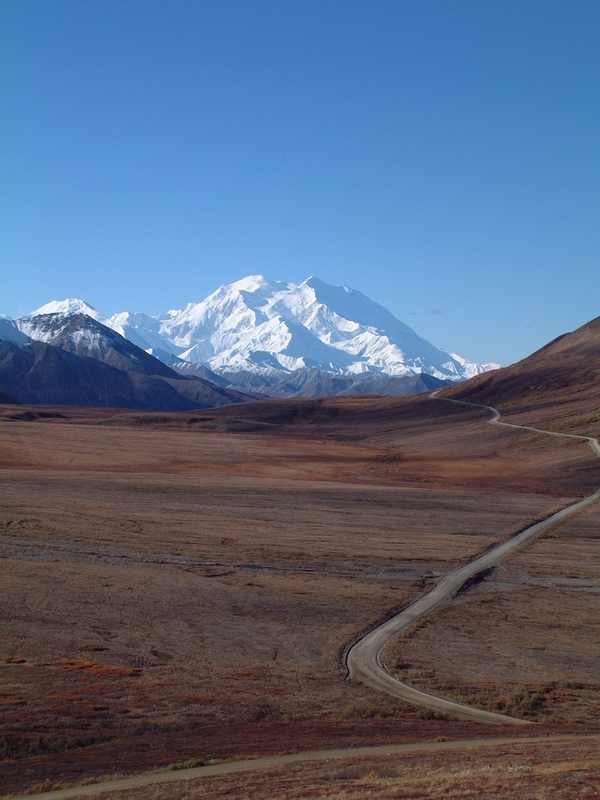 Talkeetna Musings | Alaskan at Last! After a very slow and mild start to the winter season in south central Alaska the last couple of weeks have done wonders in catching up with more ‘normal’ conditions. We went from no snow pack on Thanksgiving Day – the first time in six such holidays I saw no snow on the ground – to a 21.5 inch (54.6 cm) snow pack as of this morning with more light snow coming down. As is typical for the this area – for those wondering I live around 7 miles (11.3 km) south of the village of Talkeetna and maybe 0.5 miles (0.8 km) east of the Spur Road – our recent snow events have seen calm conditions which allows the new snow to really accumulate on any almost horizontal surface. This makes the trees and brush look gorgeous sporting a thick layer of pristine, white snow. Our weather conditions are much closer to what we should be seeing in early to middle December although there remains a rock hard 0.5 inch (1.27 cm) layer of ice atop the ground from earlier bouts of freezing rain and rain. I’m pleased no end as I feared with the existing El Nino and that warm pool of water remaining in the north Pacific we might well see yet another ‘winter that wasn’t’. Even so we have yet to see a real Alaskan snow event; one in which over 12 inches (30.5 cm) is dumped within a 24 hour period. To this point the most snow I’ve measured in a 24 hour period was 8.8 inches (22.4 cm) on December 3rd. I miss the truly heavy snowfalls I did experience the first few winters up here; they are truly a beautiful event at least as long as one doesn’t have any commitments requiring driving until the roads are plowed. However, I’m not complaining as I have also seen a couple of winters when we struggled to even reach a 21 inch (53.3 cm) snow pack. As the snow continues to fall as I write this I suspect we’re probably closer to seeing a 22 inch (55.8 cm) snow pack and our forecast is calling for on again/off again snow across the next week along with some more seasonal (i.e. ‘colder’) air temps. The dogs are loving the weather as well; Delilah, my mostly ‘Russian Bear Dog’ – more properly known as a ‘Caucasian Shepherd Dog’ – truly loves the snow and I often see her both rolling in it and hunkering down next to snow drifts. Qanuk, my German Shepherd Dog, has always loved snow and he really enjoyed running through the couple inches of new snow during this morning’s walk. Even little Skye, the mix I’m currently fostering, was having great fun running through the snow and attacking Delilah and Qanuk from hiding places created by snow piles. We’re all snow and cold lovers so this season is made for us! Thanksgiving Day 2018…plenty of ice but where’s the snow..?!? Deep accumulated snow underscores the lack of wind! Delilah, Skye & Qanuk at play! It has been quite a while since my last posting to this blog and while I’ve been meaning to get back into writing the fates, and my own poor time management skills, have conspired to keep me from satisfying this urge. But now I finally have some time so I’m going to use it. October is usually a pretty full month for me as I often have my college buddy (Sarge) visit me for two to three weeks of project work ‘round the ole homestead. This month was no different as he spent 20 days here and we accomplished a lot of planned projects and tackled a few which were unplanned. But this covers just October so where was I during much of August and all of September..? The answer is contained in my last entry which was around August 8th; at that time I was really getting involved in fostering large, older rescue canines. I found I love the work but I’m also discovering it can truly be a handful and there are times I wonder just what was I thinking when I started this process. But the efforts are so rewarding and ‘AK Cat & Dog Rescue’ has some of the most caring, loving and willing members; I always find myself amazed at how much they give of themselves! Across August and into September I fostered a number of rescues and seriously thought about ‘foster failing’ with some of them but I stayed the course and helped them find their new ‘forever homes’. I found it difficult to give up most of them but also found the knowledge they were going to situations which were much better for them to be of some comfort. From left to right Qanuk, Izzy and Delilah just chillin’..! Then, on September 21st, I agreed to foster a roughly two year old, 80+ pound female who is mostly ‘Russian Bear Dog’ more properly known as ‘Caucasian Shepherd Dogs’. Her name is Delilah and I met with her current foster who had to give her up because Delilah wouldn’t leave her daughter’s ferrets alone. I knew nothing of the breed but some quick research suggested this breed has a bad reputation and makes a poor ‘pet’. Although I was a bit concerned I also knew Delilah wasn’t a purebred and I know of many breeds which have been unfairly stigmatized so I went ahead with the ‘meet and greet’. Delilah is a large fur ball full of energy, playfulness, mischievousness and love. Her original owners must’ve really traumatized her with a lead as she refuses to wear one; if I can even get one on her she just sits down, refuses to budge and howls mournfully. Usually, if she sees me even pick up a lead she runs away and will not come to me as long as I’m holding it. This is something I’ve begun working on as she has to be able to work with a lead when we visit the vet and similar activities. She also had no understanding of boundaries; she crowds the exterior door when she thinks we’re going outside, she will just suddenly stop in front of me when we’re walking, she has no issue walking on my feet and she puts her front paws on counters and tables to see what is on them. I know I have my work cut out for me but I also know she’s a very smart girl and already we’re making progress on these undesirable habits. One wet and tired dog! As I’ve come to know Delilah I am seeing so much of my beloved Alaskan malamute (Anana) in her; sometimes it feels like Anana’s ghost is wandering the house. Delilah loves anything on two legs just as Anana did; she also will howl which is something I’ve so missed since Anana’s passing. Delilah has a HUGE stubborn streak which, again, reminds me of my Anana. Thankfully, my ‘little’ angel was a patient teacher even when she was young and she taught me all about picking my battles and coming to ‘agreements’ regarding behaviors and training. These are all learning’s which have served me well thus far with Delilah and allowed me to work with her. If someone didn’t have these skills and experience they would be for a very tough time; I well remember my frustrations with these traits when raising Anana! Typical training techniques like using a stern, loud voice and chastising when the dog has done something wrong will not work with either breed. One can sometimes verbally impress upon them that a behavior is unacceptable but the best way to reinforce this is to remove the dog from the rest of the pack for a time. And just like Anana, when Delilah gets fixated on something or someone no amount of screaming will get through their thick skulls. We’re going to work on this in a bit using a just purchased e collar but I also know this is a breed characteristic and hence can only be ‘modified’ under the best of circumstances. Delilah doing her “aren’t I just too cute” routine. By the middle of October I decided I would ‘foster fail’ with Delilah and started the paperwork to formally adopt her. I find just having her around provides me with a challenge but she is also a very loving canine worthy of another chance. Sure, she has some very rough edges – don’t we all – but I can see a very special canine in her. She is a wonderful watch dog yet she has already visited most of my neighbors; all of them have told me what a marvelous girl she is and how much personality she exudes. She plays well with other canines and barks at moose but doesn’t chase them. All told, having Delilah as part of the ‘WasAK’ pack has been a very positive experience for Qanuk and me. Yet another example of just how rewarding fostering rescue canines can be! I’m watching the rescue site for yet another older, large canine in need of a foster; while two large dogs are really enough I still want to give a little something back to the canine world and I believe fostering rescues is such an activity for me.